Topaz 6mm Bicone Drop (1) – Add 1 – Topaz 6mm Glass Crystal Bicone to a head pin. Create a loop in the head pin. Make a 90° bend in the head pin above the bead. Using round nose pliers and hold the head pin near the angle and bend it around the pliers to make a loop. Trim the excess head pin next to the 90º angle you first created making a loop in the head pin. Topaz 6mm Bicone Link (6) - Add 1 – Topaz 6mm Glass Crystal Bicone to an eye pin. Create a 90º angle in the Eye Pin above the last bead you added. Using a pair of round nose pliers hold the Eye Pin in the angle you created and wrap the eye pin around the pliers creating a loop. Trim the excess eye pin next to the 90º angle you first created making a matching loop in the eye pin. Repeat 5 times. Turquoise Colored Howlite 8mm Semiprecious Round Link (7) - Add 1 – Turquoise Colored Howlite 8mm Semiprecious Round to an eye pin. Create a 90º angle in the Eye Pin above the last bead you added. Using a pair of round nose pliers hold the Eye Pin in the angle you created and wrap the eye pin around the pliers creating a loop. Trim the excess eye pin next to the 90º angle you first created making a matching loop in the eye pin. Repeat 6 times. Turquoise Colored Howlite 18x25mm Semiprecious Oval Link (2) - Add 1 - Turquoise Colored Howlite 18x25mm Semiprecious Oval to an eye pin. Create a 90º angle in the Eye Pin above the last bead cap you added. Using a pair of round nose pliers hold the Eye Pin in the angle you created and wrap the eye pin around the pliers creating a loop. Trim the excess eye pin next to the 90º angle you first created making a matching loop in the eye pin. Repeat 1 time. Sand Opal AB 12x9mm Rondelle Link (5) - Add 1 - Antique Copper 2x9mm Scallop Bead Cap, 1 – Sand Opal AB 12x9mm Glass Crystal Rondelle, and 1 - Antique Copper 2x9mm Scallop Bead Cap to an eye pin. Create a 90º angle in the Eye Pin above the last bead cap you added. Using a pair of round nose pliers hold the Eye Pin in the angle you created and wrap the eye pin around the pliers creating a loop. Trim the excess eye pin next to the 90º angle you first created making a matching loop in the eye pin. Repeat 4 times. 1. Open 1 – Antique Copper 5mm Jump Ring; add the loop of 1 - Gold Bicone Drop and one loop of 1 - Turquoise Colored Howlite link. Close the jump ring. 2. Open 1 – Antique Copper 5mm Jump Ring; add the other loop of the Turquoise Colored Howlite Link you added in Step 1 and one loop of 1 - Sand Opal Link. Close the jump ring. 3. Open 1 – Antique Copper 5mm Jump Ring; add the other loop of the Sand Opal Link you added in Step 2 and one loop of 1 - Antique Copper 21x28mm Round Sun Connector. Close the jump ring. 4 . Open 1 - Antique Copper 5mm Jump Ring and add the top loop of the Antique Copper Round Sun Connector you added in Step 3. Close the jump ring. 1. Open 1 – Antique Copper 5mm Jump Ring; add the loop of the lobster clasp and the loop of 1 – Topaz 6mm Bicone Link. Close the jump ring. 2. Open 1 – Antique Copper 5mm Jump Ring; add the other loop of the Topaz 6mm Bicone Link from Step 1 and the loop of 1 – Turquoise Colored Howlite 8mm Semiprecious Round Link. Close the jump ring. 3. Open 1 – Antique Copper 5mm Jump Ring; add the other loop of the Turquoise Colored Howlite 8mm Semiprecious Round Link from Step 2 and the loop of 1 – Topaz 6mm Bicone Link. Close the jump ring. 4. Open 1 – Antique Copper 5mm Jump Ring; add the other loop of the Topaz 6mm Bicone Link from Step 3 and the loop of 1 – Turquoise Colored Howlite 8mm Semiprecious Round Link. Close the jump ring. 5. Open 1 – Antique Copper 5mm Jump Ring; add the other loop of the Turquoise Colored Howlite 8mm Semiprecious Round Link from Step 4 and the loop of 1 – Sand Opal AB 12x9mm Rondelle Link. Close the jump ring. 6. Open 1 – Antique Copper 5mm Jump Ring; add the other loop of the Sand Opal AB 12x9mm Rondelle Link from Step 5 and the loop of 1 – Turquoise Colored Howlite 18x25mm Semiprecious Oval Link. Close the jump ring. 7. Open 1 – Antique Copper 5mm Jump Ring; add the other loop of the Turquoise Colored Howlite 18x25mm Semiprecious Oval Link from Step 6 and the loop of 1 – Sand Opal AB 12x9mm Rondelle Link. Close the jump ring. 8. Open 1 – Antique Copper 5mm Jump Ring; add the other loop of the Sand Opal AB 12x9mm Rondelle Link from Step 7 and the loop of 1 – Turquoise Colored Howlite 8mm Semiprecious Round Link. Close the jump ring. 9. Open 1 – Antique Copper 5mm Jump Ring; add the other loop of the Turquoise Colored Howlite 8mm Semiprecious Round Link from Step 8 and the loop of 1 – Topaz 6mm Bicone Link. Close the jump ring. 10. Open 1 – Antique Copper 5mm Jump Ring; add the other loop of the Topaz 6mm Bicone Link from Step 9 and the loop of 1 – Antique Copper 21x28mm Round Sun Connector. Close the jump ring. 11. 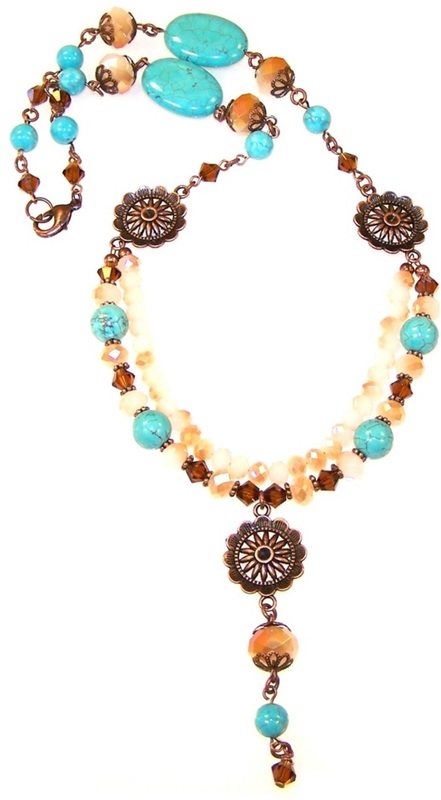 Take the 9 inch length of Copper-Colored Buddy Braids and thread 1 - Antique Copper Crimp Bead and the other loop of the Antique Copper 21x28mm Round Sun Connector you added in Step 10. Thread the Buddy Braids back through the crimp bead. 12. Squeeze the crimp bead closed until you cannot pull the Buddy Braids back through. Do not trim the excess; simply string the beads on both ends of the Buddy Braids. 13. 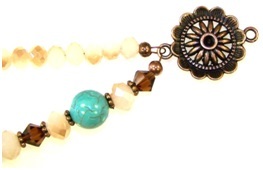 Add a Antique Copper Crimp Bead Cover by placing it over the crimp tube and squeezing it closed. 14. 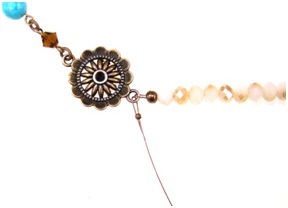 Thread 31 - Sand Opal AB 6x4mm Glass Crystal Rondelles on the buddy braids you just added. 15. Take the buddy braids and thread 1 - Antique Copper Crimp Bead and a loop of 1 - Antique Copper 21x28mm Sun Connector. Thread the buddy braids back through the crimp bead and several of the last beads you threaded in Step 14. Pull the buddy braids tight. See below. While holding the Buddy Braids use your pliers and squeeze the crimp bead so the Buddy Braids will not pull out. Trim the extra Buddy Braids. 16. 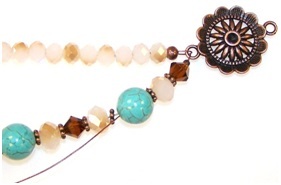 Add a Antique Copper Crimp Bead Cover by placing it over the crimp tube and squeezing it closed. 17. Take the 10 inch length of Copper-Colored Buddy Braids and thread 1 - Antique Copper Crimp Bead and the other loop of the Antique Copper 21x28mm Round Sun Connector you added in Step 10 (under the other length of buddy braids). Thread the Buddy Braids back through the crimp bead. 18. Squeeze the crimp bead closed until you cannot pull the Buddy Braids back through. Do not trim the excess; simply string the beads on both ends of the Buddy Braids. 19. Add a Antique Copper Crimp Bead Cover by placing it over the crimp tube and squeezing it closed. a. 1 - Topaz 6mm Crystal Bicone, 1 - Antique Copper 1.5x4mm Beaded Rondelle, 1 - Sand Opal AB 8x5mm Crystal Rondelle, 1 - Antique Copper 1.5x4mm Beaded Rondelle, 1 - Turquoise Colored Howlite 10mm Semiprecious Round, 1 - Antique Copper 1.5x4mm Beaded Rondelle, 1 - Sand Opal AB 8x5mm Crystal Rondelle, 1 - Antique Copper 1.5x4mm Beaded Rondelle, 1 - Topaz 6mm Crystal Bicone, 1 - Antique Copper 1.5x4mm Beaded Rondelle, 1 - Sand Opal AB 8x5mm Crystal Rondelle, 1 - Antique Copper 1.5x4mm Beaded Rondelle, 1 - Turquoise Colored Howlite 10mm Semiprecious Round, 1 - Antique Copper 1.5x4mm Beaded Rondelle, 1 - Sand Opal AB 8x5mm Crystal Rondelle, 1 - Antique Copper 1.5x4mm Beaded Rondelle, 1 - Topaz 6mm Crystal Bicone, 1 - Antique Copper 1.5x4mm Beaded Rondelle, 1 - Sand Opal AB 8x5mm Crystal Rondelle, 1 - Antique Copper 1.5x4mm Beaded Rondelle, 1 - Topaz 6mm Crystal Bicone, the Pendant you created earlier, 1 - Topaz 6mm Crystal Bicone, 1 - Antique Copper 1.5x4mm Beaded Rondelle, 1 - Sand Opal AB 8x5mm Crystal Rondelle, 1 - Antique Copper 1.5x4mm Beaded Rondelle, 1 - Topaz 6mm Crystal Bicone, 1 - Antique Copper 1.5x4mm Beaded Rondelle, 1 - Sand Opal AB 8x5mm Crystal Rondelle, 1 - Antique Copper 1.5x4mm Beaded Rondelle, 1 - Turquoise Colored Howlite 10mm Semiprecious Round, 1 - Antique Copper 1.5x4mm Beaded Rondelle, 1 - Sand Opal AB 8x5mm Crystal Rondelle, 1 - Antique Copper 1.5x4mm Beaded Rondelle, 1 - Topaz 6mm Crystal Bicone, 1 - Antique Copper 1.5x4mm Beaded Rondelle, 1 - Sand Opal AB 8x5mm Crystal Rondelle, 1 - Antique Copper 1.5x4mm Beaded Rondelle, 1 - Turquoise Colored Howlite 10mm Semiprecious Round, 1 - Antique Copper 1.5x4mm Beaded Rondelle, 1 - Sand Opal AB 8x5mm Crystal Rondelle, 1 - Antique Copper 1.5x4mm Beaded Rondelle, and 1 - Topaz 6mm Crystal. 21. Take the buddy braids and thread 1 - Antique Copper Crimp Bead and a loop of the Antique Copper 21x28mm Sun Connector you added in Step 15 (below the other length of buddy braids). Thread the buddy braids back through the crimp bead and several of the last beads you threaded in Step 20. Pull the buddy braids tight. See below. While holding the Buddy Braids use your pliers and squeeze the crimp bead so the Buddy Braids will not pull out. Trim the extra Buddy Braids. 22. 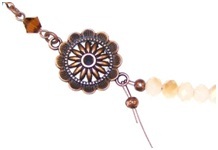 Add a Antique Copper Crimp Bead Cover by placing it over the crimp tube and squeezing it closed. 23. Open 1 - Antique Copper 5mm Jump Ring; add the other loop of the Antique Copper 21x28mm Sun Connector from Step 15 and the loop of 1 – Topaz 6mm Bicone Link. Close the jump ring. 24. Open 1 - Antique Copper 5mm Jump Ring; add the other loop of the Topaz 6mm Bicone Link from Step 23 and the loop of 1 – Turquoise Colored Howlite 8mm Semiprecious Round Link. Close the jump ring. 25. Open 1 - Antique Copper 5mm Jump Ring; add the other loop of the Turquoise Colored Howlite 8mm Semiprecious Round Link from Step 24 and the loop of 1 – Sand Opal AB 12x9mm Rondelle Link. Close the jump ring. 26. Open 1 - Antique Copper 5mm Jump Ring; add the other loop of the Sand Opal AB 12x9mm Rondelle Link from Step 25 and the loop of 1 – Turquoise Colored Howlite 18x25mm Semiprecious Oval Link. Close the jump ring. 27. Open 1 - Antique Copper 5mm Jump Ring; add the other loop of the Turquoise Colored Howlite 18x25mm Semiprecious Oval Link from Step 26 and the loop of 1 – Sand Opal AB 12x9mm Rondelle Link. Close the jump ring. 28. Open 1 - Antique Copper 5mm Jump Ring; add the other loop of the Sand Opal AB 12x9mm Rondelle Link from Step 27 and the loop of 1 – Turquoise Colored Howlite 8mm Semiprecious Round Link. Close the jump ring. 29. Open 1 - Antique Copper 5mm Jump Ring; add the other loop of the Turquoise Colored Howlite 8mm Semiprecious Round Link from Step 28 and the loop of 1 – Topaz 6mm Bicone Link. Close the jump ring. 30. Open 1 - Antique Copper 5mm Jump Ring; add the other loop of the Topaz 6mm Bicone Link from Step 29 and the loop of 1 – Turquoise Colored Howlite 8mm Semiprecious Round Link. Close the jump ring. 31. Open 1 - Antique Copper 5mm Jump Ring; add the other loop of the Turquoise Colored Howlite 8mm Semiprecious Round Link from Step 30 and the loop of 1 – Topaz 6mm Bicone Link. Close the jump ring. 32. Open 1 - Antique Copper 8mm Jump Ring and add the other loop of the Topaz 6mm Bicone Link. Close the Jump Ring. You are finished! This pattern makes a necklace that is approximately 24 inches long. You can make more necklaces by changing the color combinations around to anything you like!